Today is Progressive Eats Day and we’re celebrating all things citrus! I’ve made you some blood orange muhammara. It’s a Middle Eastern walnut dip that is hard to stop eating. Instead of the usual one-two punch of lemon juice and pomegranate molasses, I’ve substituted blood orange juice and a blood orange reduction. 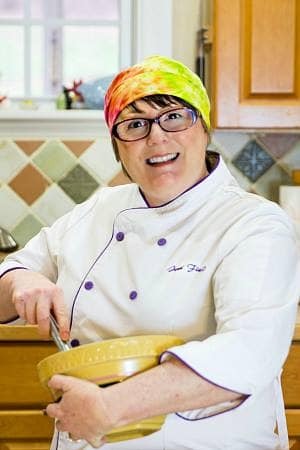 First, let’s check out this month’s line up, hosted by Coleen Hill of The Redhead Baker. Progressive Eats is one of my favorite times of the month. I try to think outside the box and really bring the theme home in new and delicious ways. All these ladies push me to be better and more creative, and I love it! Thanks so much to Coleen for hosting this month and to Barb from Creative Culinary for coming up with this great concept. This is the second time I’ve made muhammara. The first was from a recipe in Judith Finlayson’s most excellent and encyclopedic The Chile Pepper Bible. The original version of this Middle Eastern walnut dip gets tang and zing from lemon juice and pomegranate molasses. In this version, I subbed in blood orange juice and a blood orange reduction. I also added in some ras al hanout–a Moroccan spice blend that translates to “top of the shop.” In other words, it’s a spice blend with all the best spices each individual spice shop carries. I got my ras al hanout from Savory Spice Shop, although I recently saw that McCormick’s has a ras al hanout blend available at our local Lowes Foods. 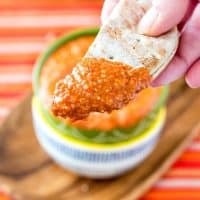 The combination of slightly bitter, tangy blood orange juice and reduction along with the warm spices in the ras al hanout–mace, nutmeg, cardamom, saffron, ginger, turmeric, and more–really make this dip sing. The base is roasted red peppers, toasted walnuts, and toasted pinenuts. Think of it as a Middle Eastern pesto that uses peppers in place of herbs. It has a bit of heat, a bit of smoke from the roasted peppers and the hot smoked paprika I decided to add, and it is decidedly more-ish. A wonderful appetizer before our citrus extravaganza! 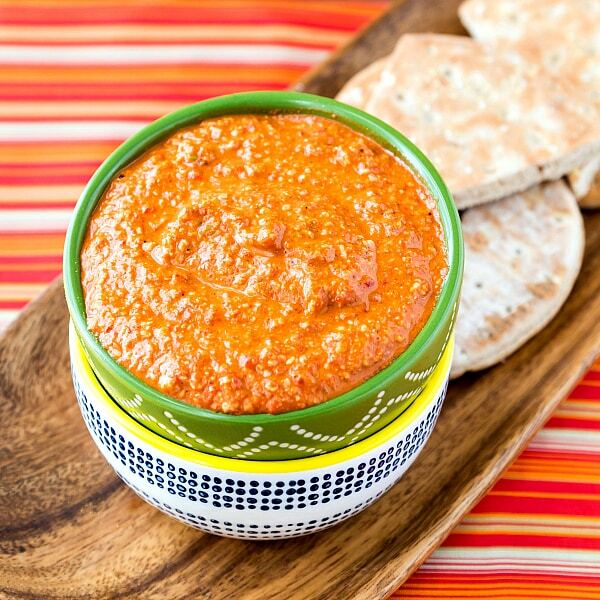 This Blood Orange Muhammara is tangy, a bit hot, warm with spice, and bright with blood orange. You will not be able to stop at one bite! 1 small spicy, (or not so spicy) red pepper of your choice, seeded and cut into strips. Original recipe calls for finger peppers, but use what you can find. I used something called a Fresno pepper which wasn't especially hot. Place all the ingredients except for the olive oil in the bowl of your food processor. Put on the lid and pulse until the consistency of chunky salsa. With the processor running, pour in the olive oil in a steady stream until pureed. There will still be some texture from the nuts. You can leave it chunkier if you want, but I like it smooth. Your call. Cover and let sit for 30 minutes or so for the flavors to develop. Enjoy and store leftovers in the fridge for up to 5 days. To make the blood orange reduction, put one cup of freshly squeezed blood orange juice in a small saucepan. Bring to a boil and then keep at a low boil until reduced to 2 Tablespoons. Keep an eye on it so it doesn't boil over or burn in the pan. You shouldn't need to stir, but you can swirl the pan every once in awhile. 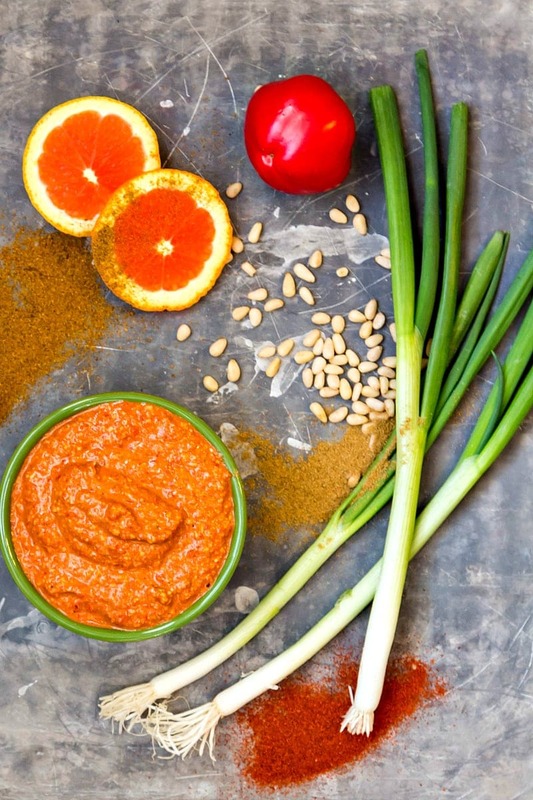 Here are some of my picks for equipment and ingredients to help you make blood orange muhammara. Please keep in mind that there are no two ras al hanout blends that are exactly the same, so read the ingredient list to make sure there’s nothing hiding in a blend that you don’t like. Thank you for supporting PCO by shopping through my affiliate links. Thank you again to my fellow Progressive Eats bloggers for keeping me inspired and pushing me to be creative. And thanks to Judith Finlayson for the excellent base recipe, and for being excited when I told you I was making a blood orange variation. Please do visit all our other bloggers–there are so many wonderful recipes with citrus, both sweet and savory. Plus, we have a few new folks joining us in 2017! Thanks for spending some time with me today. Enjoy the blood orange muhammara. Have a lovely day. Jenni!! I love this! Oh how much I love this. I can’t wait to try it. I had never heard of it before I saw it at a local Mediterranean Deli and ordered it–I quickly realized it was the best thing ever! Both Judith’s original and this blood orange version are really good, Theresa! Totally worth making! I’m with Theresa–this is a dip I’ve never experienced before! The color is spectacular and I’m sure the taste matches its beautiful appearance! Thank for the introduction. Believe me, the first time I had it, which was only a few months ago, I could not stop eating it. 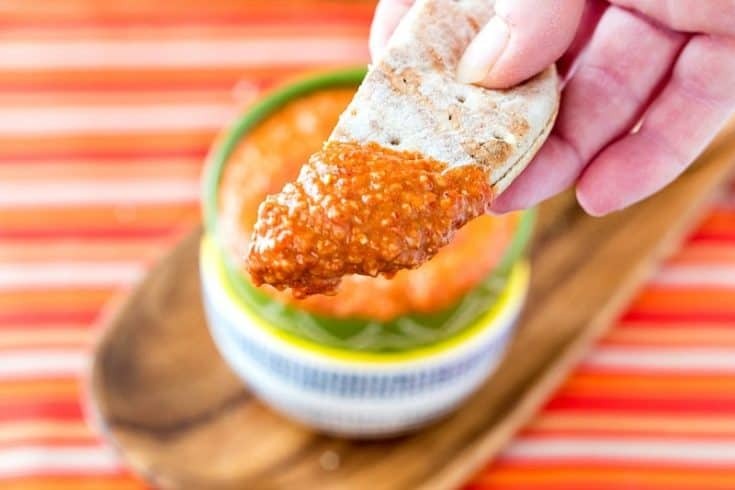 When the opportunity came up to review Judith’s book and muhammara was one of the recipes I could make for it, I abandoned all thoughts of featuring a dessert–so good, Liz! I have that cookbook too, and really love it! Great addition of the ras-el-hanout. I add it to a LOT of things!! Judith pretty much wrote a delicious encyclopedia, right?! And I am glad I remembered I had some ras al hanout. I really should break it out more often–so versatile and complex! What a great spin on the traditional recipe. So smart Jenni! So smart to sub in that orange reduction for the pom molasses. And Ras el Hanout is one of our favorite Tasting Jerusalem monthly ingredients. Versatile, exotic, and yet totally approachable to use in so many things. Thanks, Beth! And welcome to the group–so great to have you in Progressive Eats! I’ve made muhammara before, but it’s been years. This is such a beautiful color, makes me want to dip ALL THE THINGS in it! I bet the blood orange flavor is really nice with the red pepper. It really is so sunny and lovely! And now that I’ve made both the “original” with Pom molasses and this version, I would recommend either or both. So good! I cannot wait to try this. Just at the moment when I’ve become a bit tired of hummus, you show me the way to a new and incredibly delicious-looking alternative. I have raz al hanout and most of the other ingredients – so what am I waiting for:)? You’re going to love it! 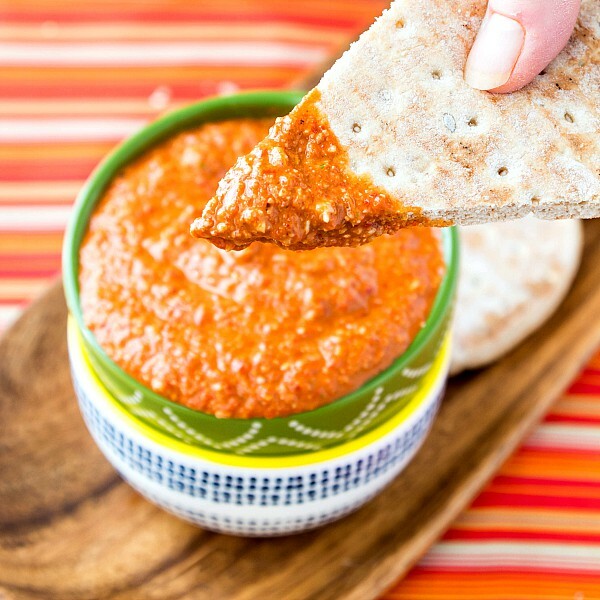 The first time I made it, I roasted my own peppers, but plopping in a jar of fire-roasted guys made really quick work of this dip. Delicious!